DoctorUV offers a variety of UV curing systems for inks, adhesives, coatings, and more. From small, simple devices for R&D use to complex, conveyor-fed production setups, we have the ideal UV curing system for your application. First adapted commercially in the 1960s, UV curing offers numerous advantages over other drying and curing methods. Using high intensity ultraviolet (UV) light, UV curing produces a photochemical reaction that almost instantly cures inks, adhesives, and coatings. UV-cured inks, coatings, and adhesives exhibit improved physical properties over those cured/dried by other methods. No solvents! A truly green technology! A high speed, low temperature, solvent free process, UV curing acts via photopolymerization rather than evaporation. This allows for near-instant curing, which in turn increases production speeds and reduces reject rates. UV curing systems require less floor space and energy than other types of drying equipment, and the process can help increase yield while minimizing scrap. UV curing has proven useful in a broad spectrum of industries and applications, from medical and scientific device manufacturing to printing and packaging to artistic and educational pursuits. Our inventory of UV curing systems includes high-performance solutions from the industry’s leading manufacturers, including Heraeus/Fusion UV and Integration Technologies. No matter what your UV curing needs, we have the right solution. Contact our expert team if you’re unsure which UV curing system will work best for your unique needs—we’re happy to help! Follow the links below for additional information, request a quote on the equipment you need, or contact us to learn more. UV lamps and equipment are used to cure UV structural adhesives for bonding glass, plastic, metals, ceramics and ferrites. UV lamps and equipment are used to cure conformal coatings, glob-tops, sealants, potting compounds and encapsulants for electronic and electrical applications. UV lamps and equipment are used to cure UV resins as sheet laminates, paste and gels for composite manufacturing, cladding pipework and tanks for environmental protection, boat and general repairs. 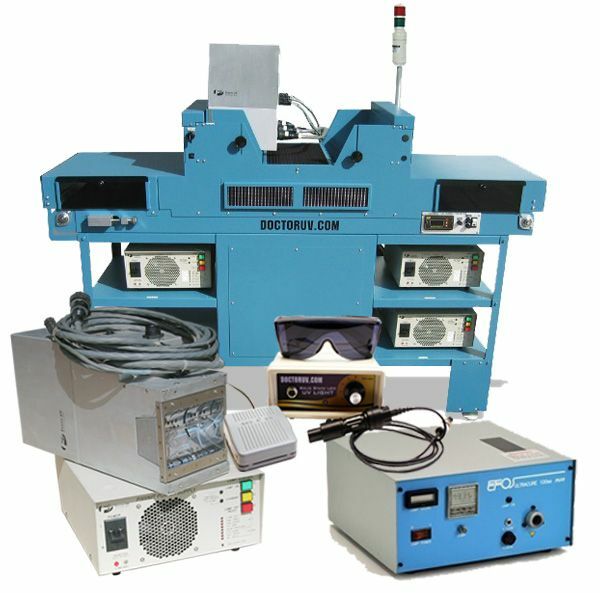 Request a quote or contact DoctorUV for the UV curing equipment your application requires.